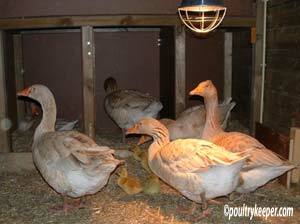 Those last few days were so exciting: would we get goslings? I was driving my Belgian friend mad with my phone calls and questions, he said “You’re in joyful anticipation” and he was right. It was so wonderful to see how our Carmen took care of her eggs, how she covered them with straw and down when she went off for ten minutes to eat, drink or to take a bath. It seemed like Carmen had a clock inside of her body because she knew exactly how long she could stay off her nest for. After those ten minutes she walked in a special way back to her nest and I could tell if she was going back to her nest or not. Saturday. Day 28. I became even more excited, although some friends had told me incubation could last until day 31, but if they were “fresh” eggs they would probably hatch earlier than later. Of course I was very alert on that 28th day and when Carmen went off her nest in the afternoon to take a bath I went quickly into the barn to check her eggs. Yes! One egg with a hole in it so it wouldn’t take that long now. Sunday morning. I got out of my bed very early to check on Carmen and her eggs. Unfortunately nothing to see or hear yet so I didn’t disturb Carmen. An hour later I went back again and oh boy something was wrong over there. Alicia who wasn’t broody had pushed Carmen off her nest and Alicia was sat on Carmen’s eggs. Poor Carmen sat next to her and looked at me as if she was trying to say “I’ve sat on them for weeks, done all the work and now Alicia takes my children away!” I couldn’t allow that of course so I put on some gloves, because Alicia isn’t the most friendly of Geese when she’s sat on a nest and can be very stubborn. I had to be careful not to damage the eggs or goslings. I carefully took Alicia off the nest and she protested loudly and tried to bite me as I put her outside of the barn. Carmen quickly climbed back on her nest and…………just before she sat down I saw a little head and heard some small peeping. Yes we had a gosling! I put some wiring in front of the nest and made a kind of maternity room in the back for Carmen on her nest so Alicia couldn’t bother her anymore. Every now and then I went to check on her to see if any more goslings had hatched. It’s wonderful how tame Carmen has become and she didn’t mind me sitting on my knees in front of her nest. I was on my knees in front of her nest for hours with my camera in my hand. On the other side of the wire, the other geese also waited in suspense. As I sat on my knees I regularly asked Carmen “Carmen please stand up, I can’t see anything” and she would look at me with her head a bit slanted and then would stand up so I could see if some more goslings had hatched. I even saw them all wet at barely 20 to 30 cm distance. Carmen was OK with me being so close. She trusted me completely. Carmen had five beautiful and healthy goslings that year. It was beautiful to see that she cleaned up the egg shells herself by….eating them. After a few days I let the other geese in with them and they played foster parents. 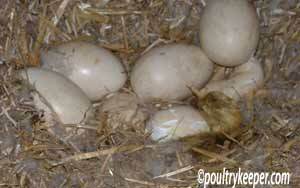 Although the hatch went very well, we didn’t let our geese hatch their own eggs during the following years. I was so shocked at how much weight she had lost after sitting on a nest for four weeks, even with the room service I provided for her. 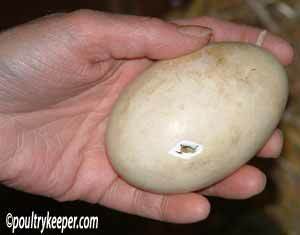 The year after we bought an incubator to hatch our eggs. Our geese didn’t like it when I collected the eggs the first year but now they don’t mind anymore. Our ladies know they get their goslings when they are about two to three weeks old. We raise them inside our house during the first couple of weeks and after that, their parents teach them the “goose stuff”. 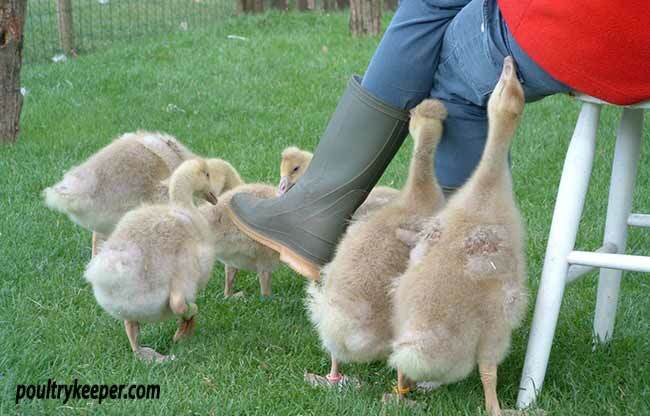 The advantage of raising the goslings yourself for the first few weeks of their life is that they become extremely tame and friendly towards people. 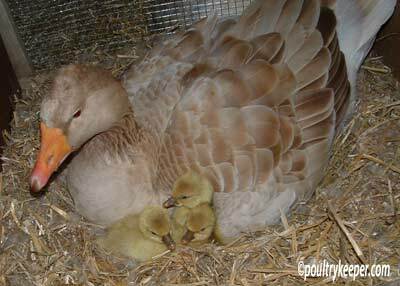 The reason we started breeding is that the two breeds we have are endangered breeds which we hope to keep alive but mostly our geese are pets to us. They are part of our family, just like our cats. Andrea Heesters is from Broederey De Weydegansch in Holland where they keep and breed Tufted American Buff and American Buff geese.